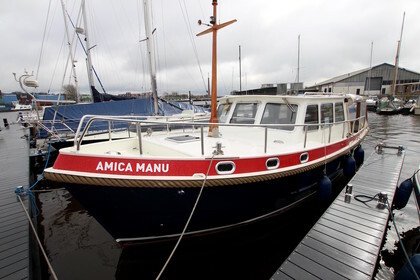 SOLD : "Amica Manu" is a Steel Barkas 10.30m. The hull was desinged in 2000 and the boat was finished in 2004. The interior has a lot of light and is really confortable. The after dek is spacious and has a isolated hardtop made in 2015. The boat has double glass windows and is completely isolated. In the summer time the boat is fresh and cool and in winter time you can keep it warm and cosy. The Vetus engine delivers 62 HP and has 1400h. It's located in Bergen Op Zoom. Feel free to contact us to get more info about the boat.